The 2019 Social Media Marketing Calendar can help you accomplish your goals for any business marketing venture. It doesn’t matter what type of business you’re trying to promote, this template is designed to be easily customized and fit any need! The main purpose of the Marketing Calendar is to structure and organize your posts, helping you become more efficient and consistent. You no longer have to worry about updating your status or adding new posts. With this document, you’ll have a comprehensive list guiding you through each day of the week! The first step is to download the document by clicking on the link located at the bottom of this page. Next, you will customize the template to better suit your tastes. You can change the font and the colors of the document by using the tools on the Home ribbon above. You can also change the stock photo, simply right-click the image and select “Change Picture” from the drop-down menu. In the first column, go through and change the social media platforms to the ones you commonly use. Each day of the week is separated into two separate boxes. In the top box, you can write a general idea/description. In the bottom box, you will enter details about that idea. This is helpful when you’re too busy at the time to go into specific and just want to write your idea. At the very bottom of the page, there is a special table in which you can enter a specific post that will go into all your social media platforms. 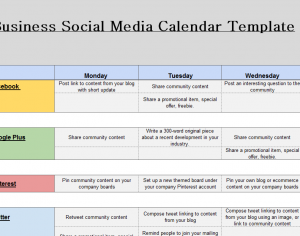 Start organizing your social marketing plans today, download this free template now!